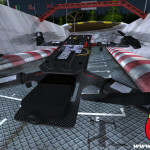 FrozenPepper is very excited to announce the all new Drone GP 15 which will bring a whole new dimension to racing games ! 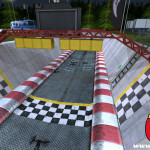 In DroneGP you will grow as a racing drone pilot through various classes of vehicles on many different tracks. Starting with small, light and easy to control multicopters you will learn to master the whole new dimension to races that DroneGP 15 brings, you’ll follow ideal curve lines in 3d space and try to improve your lap times as you would on a car racing game. AI players fly the physically realistic vehicles just like you granting a challenging and always changing race experience and multiplayer allows for epic multiplayer races ! Very rich audio design and oculus support for full immersion ! The game will be released (soon) for Mac and PC, as well for iOS and Android (newer devices). Game adapts to platforms providing different detail levels, number of players , models and many other settings, please don’t consider it a port, the whole project begun with multi platform in mind and experience on Pc or Mobile should be exactly the same as if we had worked planning to release on only one of the platforms. Oh.. and… There is a free “multiplayer oriented” alpha version available now for Mac and PC ! I agree make it free and is there free flying and can you fly like around a city place. Hello Vince, Drone GP is a pure racing title, therefore we will have “practice” but i doubt you will be able to fly around a city place. For such those things we have released Rc Heli 3 where you can fly helicopters and drones while gently free flying around a city place. Check it out! The alpha version is already out, I have on my Mac laptop. It’s very realistic and challenging. Try it! This looks cool. Will it be on steam eventually? Looks so so so cool. I WANT IT !!!!!!!!!!! So, like everyone else wants to know—WHEN is it gonna be released! Keep saying soon, but now it’s been 4 months since you last said that! It’s disappeared from Toucharcade and nary a word about it for a long time! Whassup, man? The iOS version is ready to rule since a month ago, but it’s still in the approval stage by Apple. We can’t do anything but wait and we hope not much longer.